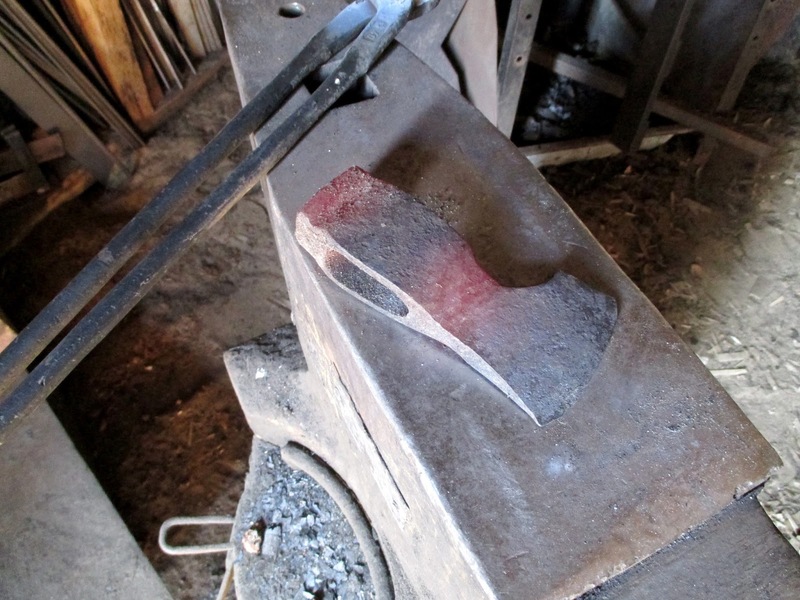 While Pasi Hurttila may best known for his puukkos and leukus, he recently forged a hatchet for his own use and featured it on his blog, “Life In The North”. 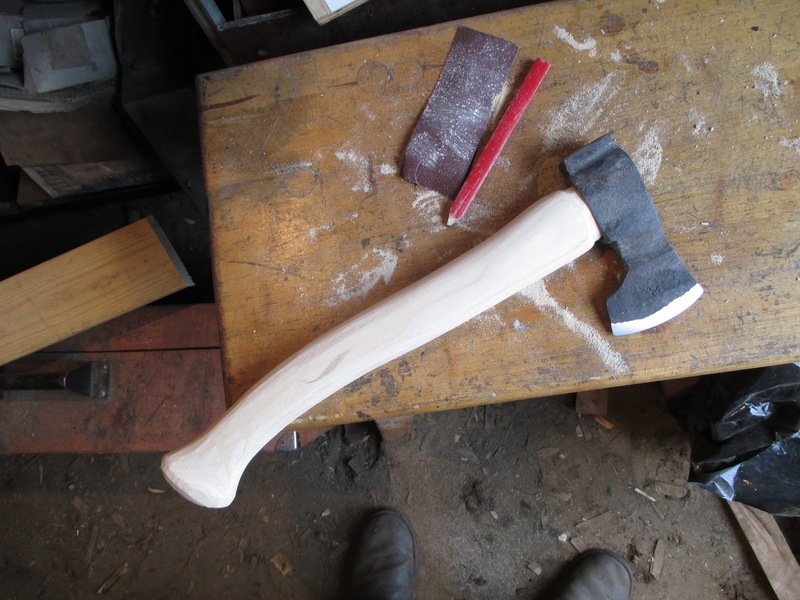 I am an admirer of Pasi’s work and asked him if I could do a post about the hatchet and he kindly agreed. 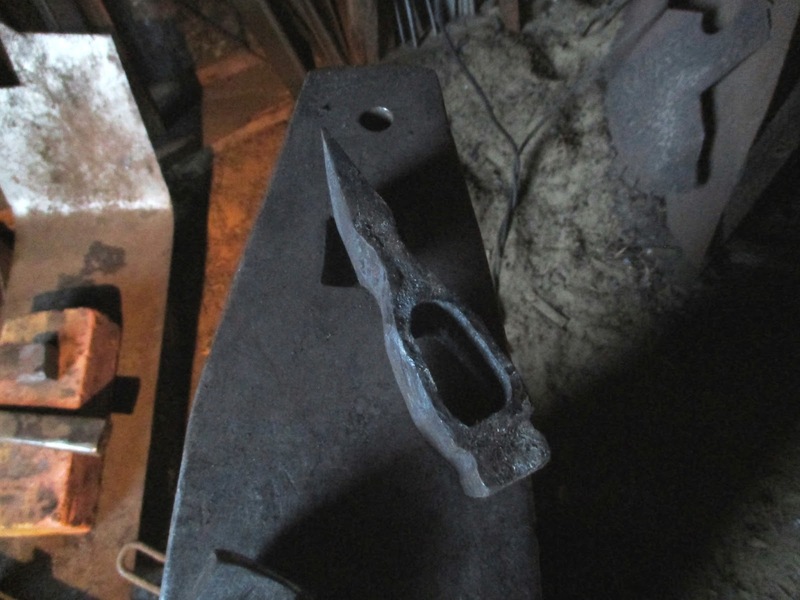 Here is the transition of a piece of leaf spring from a truck to a classic hatchet! 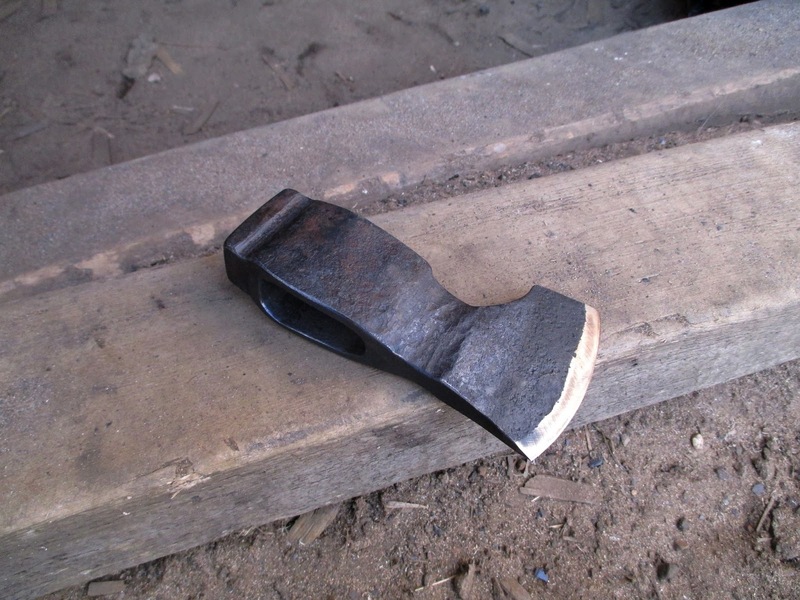 This axe head starts it’s life as a piece of truck leaf spring. Cut off with an angle grinder and then annealed. Then I drill a pilot hole for the eye drift. This is not necessary of course, but helps when punching the eye. Especially when working alone, and without power hammer or press. Punching the eye. Takes many heatings to get it done. 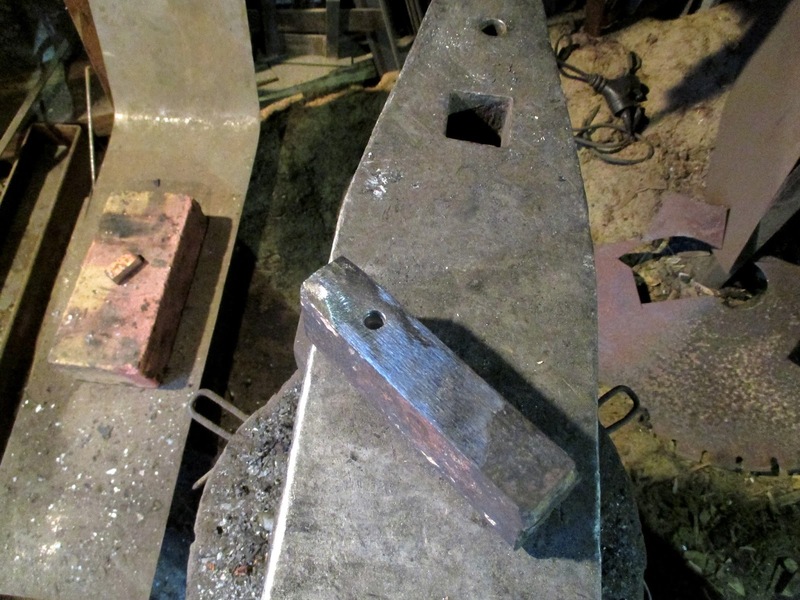 Starting to form the blade, for this I wanted some beard, and a bit of thinning behind the bevel to reduce weight. 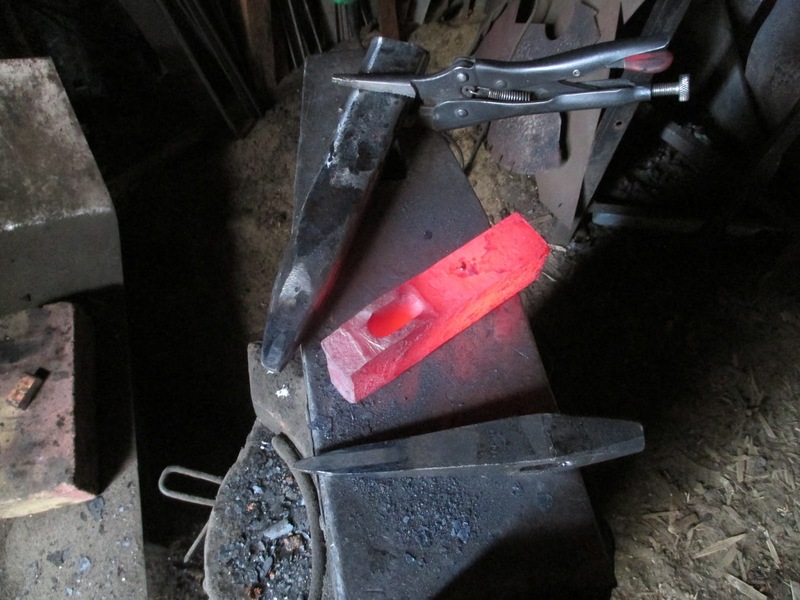 Blade bit and poll are forged in shape. Corners filed down and shape finished, edge sanded ready for heat treatment. 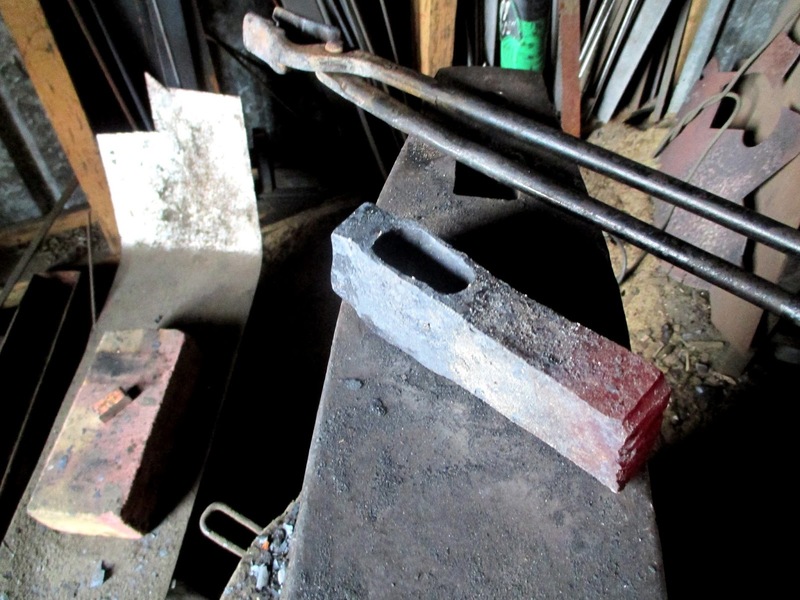 Edge is hardened in oil, then immediately tempered on glowing coals of the forge. When tempering is finished the whole head is dipped in tar and excess is wiped off. 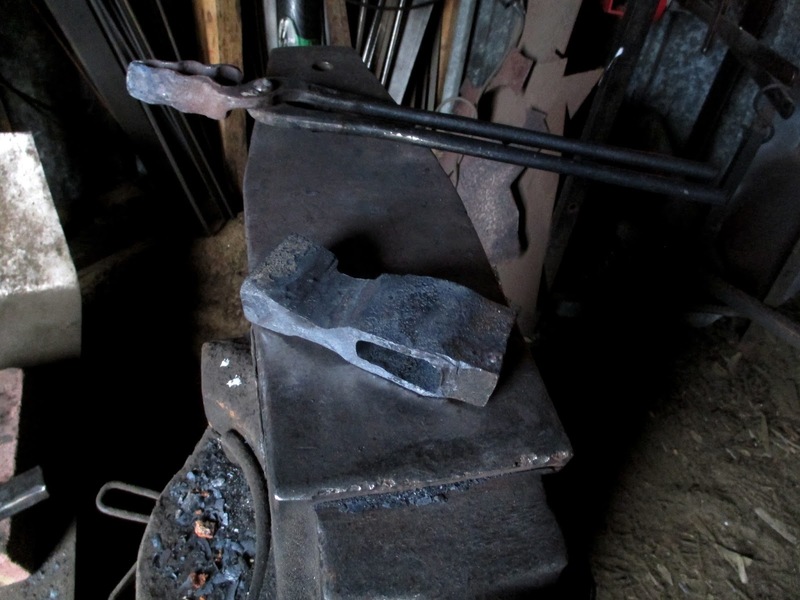 Then it’s time to start with the handle. Shape is drawn and cut out with a jigsaw. This time I used white ash. I still have some planks left from the time I used to make bows. Good material for tool handles. 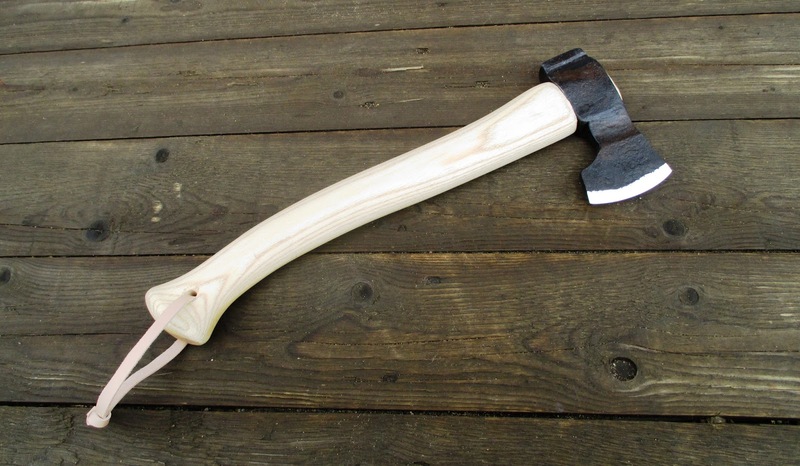 The rest of the handle work is done with rasp, file, and sandpaper. First the eye part is fitted, leaving last half a centimeter to be hammered in when finally fixing the head. 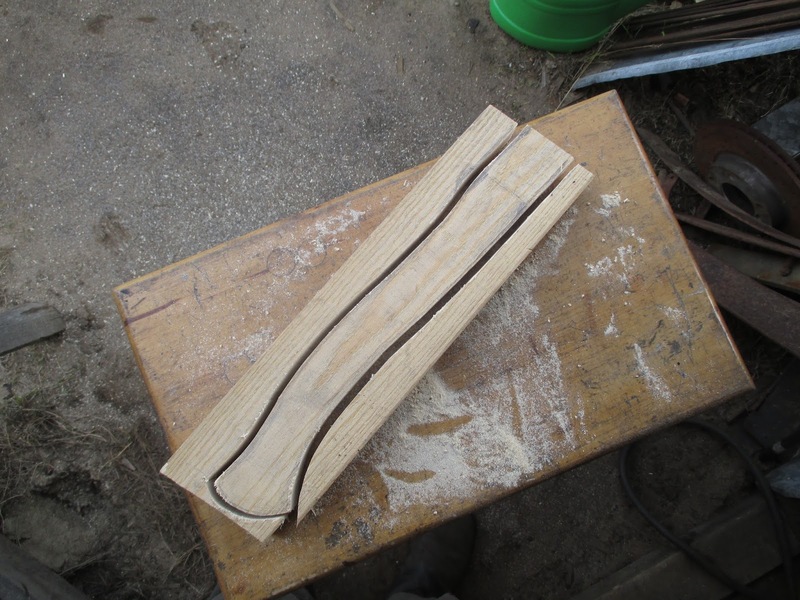 I like to use cross wedges, so next thing was to saw two slots for them, and whittle the wedges from juniper. Before the handle is finally fixed I sanded the edge of the bit, and finished the handle with coarse sandpaper. 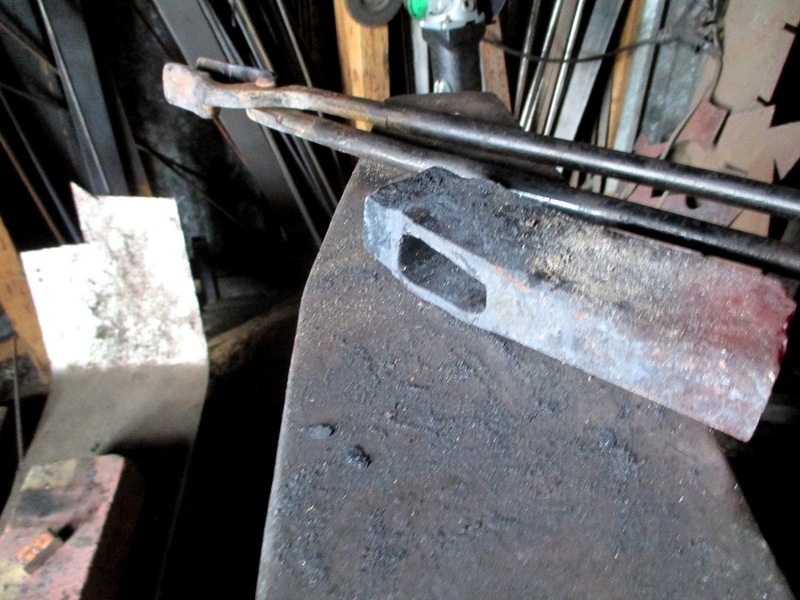 Then just fitted the handle in it’s place, hammered wedges in with some wood glue, and let it dry. Next day it got some boiled linseed oil for protection, as well for the head itself. 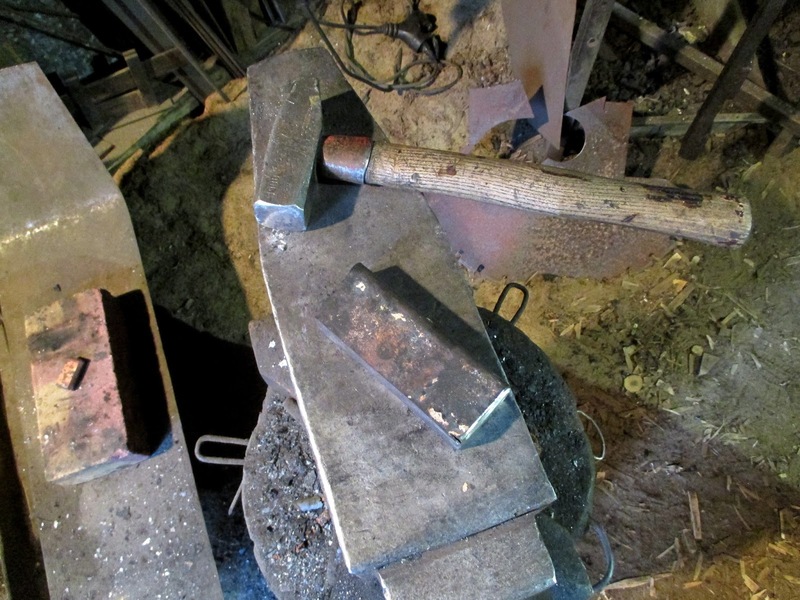 “This axe came out weighing about 800 grams, with a total length of 40cm. Edge is about 7cm. Decent size for my needs. The edge needs to be aligned straight with the handle. 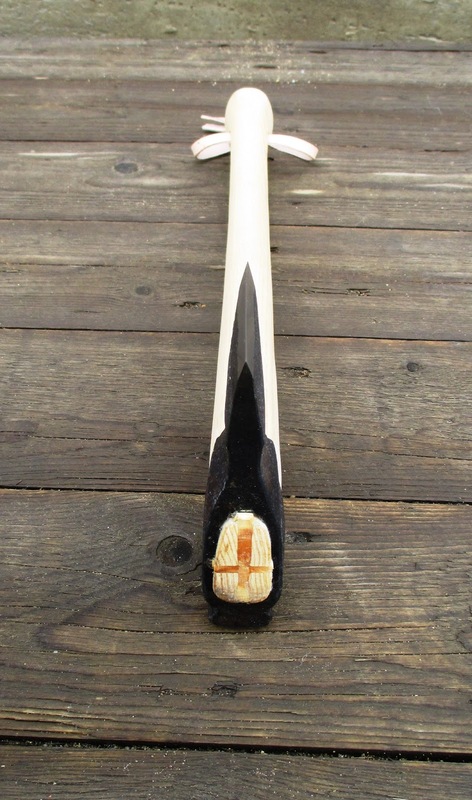 Decent end knob is a must in a wilderness axe, as you sometimes work with wet hands and tired. 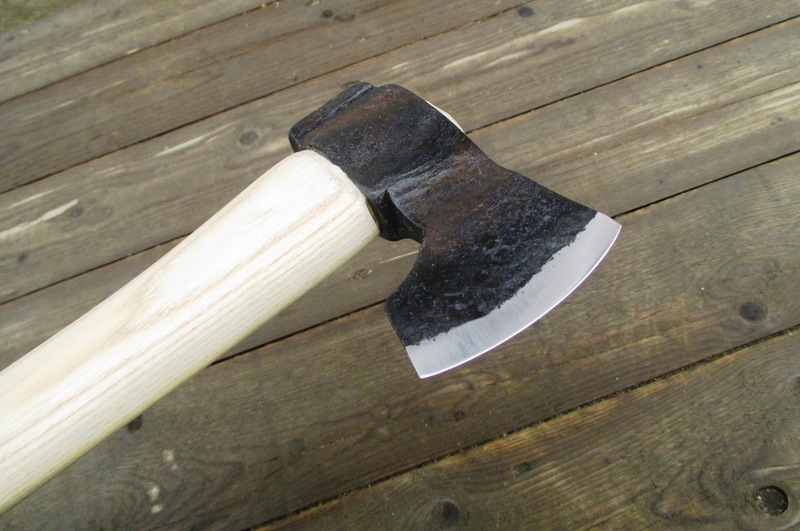 I’m not that strict with bevel/edge geometry of my outdoor axe. Usually I use flat bevel with a secondary, convex works too. 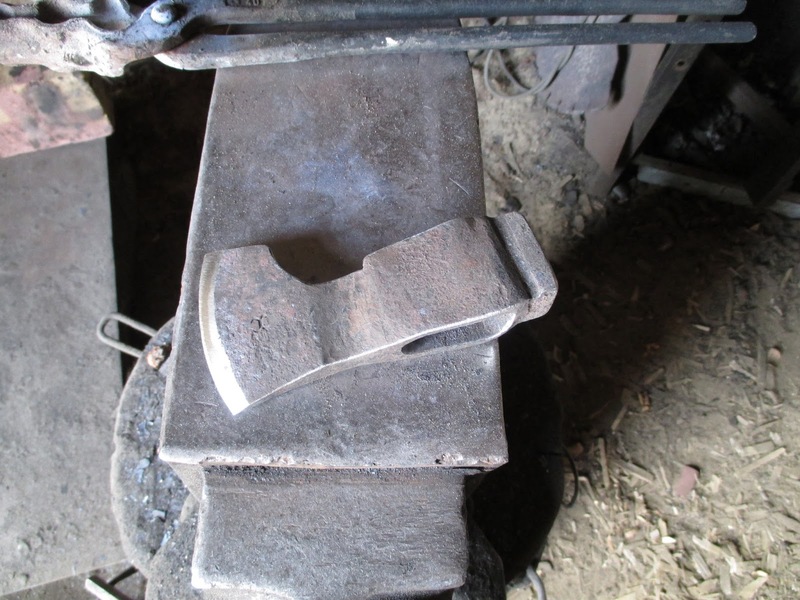 This is not a carving axe, so splitting properties are more important than being able to carve nicely.